On maps, the Oregon Trail starts just west of St. Louis, Missouri. In time, the beginning of the Trail is a bit harder to place. The first wagon train rolled onto the Trail in 1841 and emigrants eventually wore the road into a great highway, in some places a hundred feet wide and ten feet deep. Before then, however, many travelers had come to Oregon by a variety of routes: early explorers and traders from the west by sea; French Canadians and British emigrants overland from the north; companies of traders out of Spanish California from the south; and, following the fur trade, a small number of American trappers and missionaries from the east. Any number of trails already crisscrossed Oregon before the arrival of the first Europeans. The earliest Oregon newcomers found that coastal tribes, who had never before seen whites, already possessed a few guns, knives, kettles, and even silver spoons. Native Americans of the Oregon Plateau traded west of the Cascades and east of the Bitteroot Mountains while coastal tribes traveled far inland for a lively yearly commerce at traditional sites on the Columbia River. 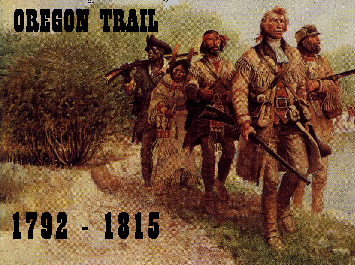 Traditionally, the story of the Oregon Trail begins with the European/American discovery of the Columbia River and the voyages of captains Gray and Vancouver in 1792. These explorers' ships were just two of the 28 trading vessels in the Northwest in that year. After the mid-1780's, a thriving sea-otter fur trade centered at Nootka Sound (on present-day Vancouver Island) as part of a vast trading network which linked London, New England, Hawaii, Canada's coastal islands, Russian Alaska, and China. In spite of well-traveled trade routes along the Pacific Coast, the mouth of the Columbia River remained hidden from explorers behind constant rain and mist until 1792. This Time Frame is designed to help researchers place individuals and events on the Oregon Trail into context. As well as a great number of very diverse people, the formation of the Trail involved many shorter journeys on future segments of the Trail. Sometimes the context of the Trail shifts to its western end in Oregon, sometimes to the fur trade out of St. Louis and Canada, and often to the travels of the mountain men who explored the region in between. Robert GRAY and the ship Columbia sailed on their second voyage from Boston to the Northwest on September 29, 1790. They spent the winter of 1791-92 at an encampment just north of Nootka Sound (on present day Vancouver Island), explored the local Pacific coast, and collected sea-otter furs for sale in China. On May 11, 1792, the Columbia crossed the treacherous sand bar at the mouth of the Columbia River and explored the waterway. Among the 50 men aboard the first ship to sail into Oregon's Columbia River were Robert HASWELL, first officer, Andrew NEWELL, seaman and veteran of Gray's first voyage, ATTOO, cabin boy returning to his native Hawaii, Joseph BARNES, a seaman who had signed on in China, John AMES and Benjamin POPKINS, armorers, Barlet PEASE, cooper, Thomas NICHOLS, tailor, Obadiah WESTON, sail-maker, Thomas TRUMAN, cook, Samuel YENDELL and Nathan DEWLEY, carpenters, George DAVIDSON, painter of the ship (and painter of art), and Samuel HOMER, a 10 or 11 year old boy. Gray and the Columbia sailed home by way of China, completing their second trip around the world, and returned to Boston on July 25, 1793. SOURCES: Vancouver and Haswell kept journals during the voyages. John Scofield's Hail Columbia includes an extensive bibliography with information on such primary sources as the journals of Haswell and Vancouver. Frederick W. Howay's Voyages of the Columbia to the Northwest Coast contains a wealth of primary materials in the form of journals, documents, and letters. "Dr. John Scouler's Journal," Oregon Historical Quarterly #6, records another early voyage to the Northwest. On April 1, 1791 Captain George VANCOUVER in the sloop Discovery and his lieutenant Captain William R. BROUGHTON in the tender Chatham left Falmouth, England, on an official British expedition to the Northwest coast of America, then known as New Albion. Among Vancouver's crew were lieutenants Joseph BAKER, PUGET, and WHIDBEY. They arrived in the Northwest in mid-April 1792 and concentrated on exploring the Straits of Juan de Fuca. In October 1792, Vancouver sent Broughton to search for navigable waterways south of the Straight. Broughton noted the Columbia River's mouth but dismissed the river as unsuitable for sea-going commerce. April 27, 1792: The captains of the Discovery and the Columbia met just 2 days sail from Cape Disappointment. Gray showed Vancouver his map pin-pointing the location of the Columbia River (then unnamed; Gray had spotted the river mouth sometime during his explorations the previous year and charted its location). Although Vancouver had noted "river-colored water" in the sea as Discovery had passed a spot off the Oregon coast just two days earlier, he dismissed Gray's report just as he had dismissed the colored water as the outflow of a few minor streams. To Vancouver, Gray was simply a gullible amateur who had swallowed another legend about a great Northwest river. May 11, 1792: Captain Robert Gray took the Columbia across the perilous sand bar and into the Columbia River. October 1792: Vancouver dispatched Lt. William Broughton to search for navigable rivers to the south. Broughton traveled just far enough into the Columbia River to judge it "not suitable for major commerce." July 25, 1793: Gray and the Columbia returned to Boston harbor after a voyage of 2 years, 313 days. Spring 1793: VANCOUVER's vessels returned from Hawaii to the Pacific Coast with Lt. PUGET now in command of the Chatham. April 1793: Lt. Puget and the ship Chatham explored the northern Pacific Coast while Vancouver and the Discovery made way up the coast of California. The Chatham reached Nootka on April 15 and the Discovery on May 20. After exploring further north, the Vancouver expedition returned to Nootka on October 5, 1793. Alexander MACKENZIE completed an expedition in 1793 that was the first to come OVERLAND TO THE PACIFIC through the Rocky Mountains. The party of 9 men left Ft. Chepewyan (near Athabasca Lake, northeast Alberta) in October 1792 and in July 1793 reached the Pacific at Fitzhough's Sound at the Bellacoola River (north of Vancouver Island) traveling by way of the Peace and Findlay rivers. By late July, the party had descended the Fraser River and again reached the Pacific (near the present Canada-US border). Among those who left Ft. Chepewyan with MacKenzie: Alexander MACKAY, Francois BEAUDIEUX, Baptiste BISSON, Francois COURTOIS, Jacques BEAUCHAMP, Joseph LANDRY, and Charles DUCETTE. In January 1794, the Spanish and British agreed that the outpost at Nootka would officially return to the British Crown but that both nations would then cease to occupy Nootka Sound. SOURCES: extensive quotes and use of primaries in Jacob A. Meyer's "Jacques Rafael Finlay" (Washington Historical Quarterly, vol.10, no.3, June 1919) and Agnes C Laut's Conquest of the Great Northwest ,(Moffat, Yard & Co., 1911); John C. Jackson's Children of the Fur Trade details the life of Finlay and other metis [part European Canadian, part Indian people]; John McDonald of Garth wrote a Reminiscence in 1798--location of modern copy unknown. In June the Hudson's Bay Company Fort Branch (just 1000 yards from Upper Bow Fort) was attacked by Sioux or Gros Ventres and 8 or 9 HBC employees killed (among them Magnus Annel, Hugh Brough, and William Fea). An employee named Vanderiel--among those saved by Jocko and his men, according to fur trapper Peter Fidler--hurried to York Factory (Hudson's Bay Company headquarters) to report the disaster. The American ship Sea Otter, under command of Capt. Samuel HILL, entered the Columbia River. Hill reported nine other ships on the Oregon coast including the Alexander under Captain Dodge and another under Captain Rowan. Many ships pursued the fur trade along the coast from California to Alaska, some of which may have sailed the Columbia River or anchored off the Oregon Coast without leaving records. Ships in Pacific Northwest waters during the first two decades of the 19th century included British, Spanish, and Russian fur-traders/explorers, New England whalers, Boston traders, some French expeditions, and even few Japanese junks. In 1797-8 David THOMPSON, Jean Baptiste HOULE and others with the Northwest Fur Company made contact with the Mandan villages of the Upper Missouri River region. In March, the American ship Eliza (Captain Rowan) traded for furs with the Kanganee Haida of Prince Edward Island (north of the Hecate Strait, northern British Columbia/Alaskan panhandle region). The Haida chief displayed a silver spoon given to him by Capt. Roberts (also an American) and explained how the Cumshewa (Tsimshian) Indians had become enemies of his tribe by forcing them from the mainland. The Americans also had an enemy among the Tsimshian, a chief named Scotseye, but sailed to the mouth of the Nass River, Tsimshian territory, and fired their cannons to begin trade. At this time, in May, the ships Ulysees (Captain Lamb) and another under Capt. Breck were also in the region. The Americans of the Eliza pretended to be British, traded with the Tsimshians for over 100 furs, and then siezed Scotseye with his brother and son as captives. Scoteye's son was ransomed for 3 of the 6 white-men's scalps held by the Tsimshian tribe plus 18 muskrat pelts. Scotseye and his brother, however, were turned over to the Kanganee Haida for execution. The crew of the Eliza joined 1800-2000 of the Haida to witness their deaths by stabbing. In 1799, the Eliza became the first American ship to sail into San Francisco (Yerba Buena) Bay. In the fall, a party of Kutenai (Indians from Canada west of the Rocky Mountains) visited traders of the Northwest Company at Rocky Mountain House (on the upper Saskatchewan River). Charles LAGRASSE, Pierre LEBLANC, and LeBlanc's wife returned to Kutenai country with them. Duncan MCGILLIVRAY and David THOMPSON, head traders for the Northwest Fur Company, visited the Pikuni (or Piegan) Blackfeet to assure safe conduct for Company hunters now moving from the Saskatchewan River to trade in the Bow River region (present-day southern Alberta). SOURCES: Nineteenth century histories of Russian America: Berkh, Vasilii Nikolaevich (1781-1834), The Chronological History of the Discovery of the Aleutian Islands; or the Exploits of the Russian Merchants; with the Supplement of Historical Data on Fur Trade: Works Projects Administration, 1938. And Rezanov, Nikolai Petrovich (1764-1807), A History of the Russian-American Company: 1978, University of Washington Press; Journals for this year by David Thompson (Hopwood, narrative; Glover or Tyrell journal, 1784-1812; Coues, journal, 1799-1814); Robert Campbell (Campbell). Fur trader Manuel LISA established a post and trade in the Osage country west of St. Louis. James PURSLEY traveled to New Mexico from St. Louis on a hunting expedition. Trade out of St. Louis into this more southern region rapidly followed and included the Arkansas and Colorado river basins and traffic to Taos and Santa Fe. Some names associated with this trade later became familiar figures of the Oregon Trail: Robert CAMPBELL, Captain GAUNT, Jim BRIDGER, DRIPPS, FONTENELLE, BLACKWELL, TRAPP, GERVAIS, BRENT, ST. VRAIN, and VAN DUSEN. In March 1802, Gros Ventres killed 14 Iroquois and 2 Canadians trapping for the Northwest Fur Company in the Bow River region (present-day southern Alberta). In 1802, the Tlingits attacked the small outpost of the RUSSIAN AMERICAN COMPANY on Sitka Sound. After, Aleuts, Inuits, and Konigas would become Russian allies and employees while the Tlingits remained fierce enemies. In 1803, the Russians sent their first expedition to California in pursuit of the sea-otter trade. During 1803, President Thomas Jefferson negotiated the LOUISIANA PURCHASE from France (then under First Consul Napoleon Bonaparte). For 80 million francs, the United States added all of France's territory between the Mississippi River and the Rocky Mountains. In 1804, rival companies engaged in the fur trade out of Canada merged, with most trade after the merger under the Hudson Bay Company or the Northwest Fur Company. The American ship Lelia Bird under Captain William SHALER could not find a safe passage across the bar at the mouth of the Columbia River in 1804. Abandoning the attempt to enter Oregon, the ship sailed south to trade in California. The American ship Boston was also attacked by the Nootka people of southern Vancouver Island in 1804. The Nootka killed all but 2 of the crew. JOHN JEWETT WAS HELD CAPTIVE until rescue in 1805. YUTRAMAKI, chieftan in the Makah tribe (a people closely allied to the Nootka) had not been able to secure Jewett's release from MACQUINNA, chief of the Nootka. Instead Yutramaki passed a message to Capt. Samuel HILL of the Lydia who arranged ransom either before or after his visit to Oregon. In 1805, Native Americans on Vancouver Island attacked and killed 8 of the crew of the Athualpa. In 1805, the Lydia of Boston, Capt. Samuel HILL, entered the Columbia River to acquire timber for spars; it returned to Nootka Sound by November 1805. From this-- and probably several other fur trading ships-- Oregon Native Americans were aware of a European-settled nation far to their east even before the arrival of the LEWIS AND CLARK EXPEDITION. President Jefferson assigned Meriwether LEWIS, his personal secretary, to head an exploring expedition into the lands added the United States territory in 1803, the Louisiana Purchase. Lewis chose his friend, William CLARK, as co-leader and assembled a party of men for the journey. The Lewis and Clark Expedition left St. Louis on May 14, 1804. [They would not reach the Pacific until late the next year and would not return to St. Louis until near the end of 1806]. By the end of July, 1804, the Lewis and Clark Expedition had reached the present-day site of Omaha, Nebraska. After they reached the site of (present-day) Mandan, North Dakota, they constructed quarters and storage rooms protected by an 18-foot stockade. Toussant CHARBONNEAU--traveling with his pregnant wife, their toddler Jean Baptiste, and a Minnitaree Indian on his way to make peace with the Shoshone--signed on as an interpreter for the Expedition. The wife, SACAJAWEA, proved most valuable as interpreter and guide. She was a Shoshone, captured by Minnitarees in childhood, and then taken in by Charbonneau. The Expedition began their Continental trek westward in spring 1805 and, by early June reached a place where the Missouri River seemed to divide into two channels. Lewis and a party traced the northern channel while Clark and 6 men determined that the southern stream was the Little Missouri. Farther west in August, at the extreme southwest of Montana, Sacajawea was surprised to find her brother whom she had not seen since she had been taken captive. Her brother, a chief, and his people provided the expedition with fresh horses and guided them through Lemhi Pass. By late August, the party was cold and hungry and Sacajawea was traveling with her newborn son, Pompey. They reached the confluence of the Snake and Columbia Rivers (near present-day Richland, Washington) on October 16, and, by November, finally achieved the mouth of the Columbia and the Pacific Ocean (Bakers Bay, just inland-ward of Cape Disappointment). To encamp for the winter 1805-1806, the Lewis and Clark Expedition crossed to the south shore, raised cabins and a stockade, and named their camp Fort Clatsop. In the winter of 1805-06, the governor of Louisiana equipped a small party to scout northward to the Yellowstone River. The scouts included Phillipe DEGIE and Francois RIVET. Five of this party (including Rivet) had helped the Lewis and Clark Expedition reach their Mandan winter camp in the winter of 1804-05. In 1805, Rivet and some others had not returned downstream to St. Louis but remained to trap in the high country. In 1804 the US government sponsored a second western exploring expedition, this one headed by Lt. ZEBULON PIKE on a southwestern route. Although the trails in this region are outside the scope of the Oregon Trail Time Frame, it should be noted that a southwest fur trade from the Sates to Taos and Santa Fe, with trails extending into California and Texas grew during the same time period as the Oregon Trail. Many of the same pathfinders would travel both regions. Pike explored from St. Louis to the Upper Mississippi to Leech Lake and back in 1804. Between 1805 and 1807, he and his command went again from St. Louis, to the Pawnee Villages, through the Colorado Rockies, south all the way to the Rio Grande, and then back via El Camino Real across Texas. On March 23, 1806, the LEWIS AND CLARK EXPEDITION left Fort Clatsop, Oregon, to begin the long journey home. On their way up the Columbia they noted Sauvies Island to the south but fog hid the Willamette River (future destination of the Oregon Trail). After Indians told them they had passed by a huge river (the "Multnomah"), some members of Lewis and Clark's crew back-tracked forty miles and explored the Willamette as far south as present-day Linnton, Oregon. At Travelers Rest, east of Lolo Pass in the Rockies, Lewis headed a party headed through the Three Forks region and the Marie River. Meanwhile, Clark went through Bozeman Pass and by way of the Yellowstone River. On August 12, the Expedition reunited at the confluence of the Yellowstone and Missouri rivers. Sacajawea and her family said farewell to the Expedition at the Mandan Fort (North Dakota). John COLTER also stayed at the Mandan Villages while the rest of the Expedition continued downriver. On September 23, 1806, the Lewis and Clark Expedition reached St. Louis after a nearly 27 month round-trip journey all the way to the Pacific. Only one man (due to illness early in the trip) had died in all the thousands of miles of hardship. SOURCES: David Thompson (Hopwood, narrative; Glover or Tyrell journal, 1784-1812; Coues, journal, 1799-1814); Alexander Henry (Coues, New Light on the Early History....); on Russian American traders (Berkh, Rezenov). David THOMPSON was in charge at Rocky Mountain House for the Northwest Company with Nicholas MONTOUR, Jacques QUESNAL, and others under his command. In 1806, John McDonald of Garth (a Northwest Company partner) ordered Jacques (JACCO) Raphael FINDLAY to improve a trail from Rocky Mountain House on the upper Saskatchewan River over the Rockies and into Kutenai Indian country. Accompanied by Kutenai Indians, Findlay, his wife, and children followed the Blaeberry River and reached the upper Columbia River on their round trip over the Rockies. Finlay's party traveled by way of Howse Pass (later named for Joseph Howse, a Hudson's Bay Co trader, who traveled the Pass for the first time in 1809). Jocco Finlay reportedly wintered on the Kootenay Plain near the headwaters of the Saskatchewan River 1806-1807 but David Thompson noted that he arrived back at Rocky Mountain House in November 1806 (accompanied by Jacques QUESNEL, Joseph Daniel, BERCIER, and BOUNARD). To bypass hostile Native Americans in the Northwest, the RUSSIAN AMERICAN COMPANY contracted with the American ship Peacock (Captain Oliver KIMBALL) in 1806-1807 to carry Russian fur traders to California. Timofei TARAKANOV sailed with this expedition and later (1808) with the disastrous Sv. Nikolai voyage to the Oregon Country. Paul SLOBODCHIKOV led another group of Russian traders sailing on the American ship O'Cain. Slododchikov quarreled with the ship's owner, Johathan WINSHIP, and left with his men in Baja Calfornia. There he bought the Tamana (a ship built for King Kamehameha I) and sailed to Hawaii with a crew of 3 Hawaiians and 3 Americans. He renamed the ship the Sv. Nikolai and anchored at Sitka Sound, Alaska, in August 1807. From 1806 to 1807, John COLTER trapped in the Three Forks (of the Missouri River) region with Joseph DICKSON and Forrest HANCOCK. In April 1807, Manuel LISA, a fur trader, Benito VASQUEZ, his second in command, Andrew HENRY and a small party (including Lewis and Clark Expediton veterans George DRUILLARD, John POTTS, and Peter WISER) journeyed from St. Louis to establish a post at the confluence of the Yellowstone and Big Horn rivers (Montana) among the Crow nation. Druillard was with this expedition to represent stay-at-home fur company partners, William Morrison and Pierre Menard. That Fall, Lisa (who intended to begin fur trade with the initially friendly Blackfeet) dispatched Colter to the headwaters of the Missouri River, the Big Horn basin, and Yellowstone area to pave the way for trade. Before winter settled in, Colter had journeyed south to Wind River, then west to Jackson Hole (Wyoming), and then crossed Teton Pass into Idaho's Wind River region. March 1807, Jocko FINLAY returned to Rocky Mountain House (Alberta) from the mountains after his exploration trip over the Rocky Mountains as far as the upper Columbia River region of (present-day) British Columbia. David THOMPSON a geographer, explorer, and trader with the Northwest Fur Company departed with fellow Nor'wester Finan MCDONALD and six other men in 1807 to explore the Columbia all the way to the ocean. His wife Charlotte and their children accompanied him on his explorations between Rocky Mountain House and the Great Divide and on his journey to the Northwest. For a time, hostile Piegan Blackfeet halted Thompson's advance into the Rockies. When the Indians were diverted by a reported skirmish between Blackfoot kinsmen and the Lewis and Clark Expedition (then well to the south on their return journey), Thompson and party made way through Howse Pass. Here, in June 1807, the explorers found Finlay's steep, narrow trail, which he had blazed for a length of forty miles. The canoes Finlay had prepared for navigation of the Blaeberry River had been stripped of their birch coverings by porcupines and mice over the winter. David Thompson severely criticized Jacco Findlay's preparation of the trail and demanded that he be fined and lose half his yearly wages. Findlay resigned from the Northwest Company and became a free trapper allied with the HBC. He worked out of Edmunton House (under James BIRD and Peter FIDLER in 1807) and rejoined the Northwest Company in 1810. Probably in this Autumn, 1807, Finan McDonald established Lake Indian House on the Kootenai River in Idaho. (this post was abandoned in favor of Spokane House in 1811). SOURCE: David Thompson (Hopwood, narrative; Glover or Tyrell journal, 1784-1812; Coues, journal, 1799-1814). In September 1807, John MCCLELLAN, Francois RIVET, and a large party of American and Canadian independent trappers (perhaps including Charles COURTIN, Registre BELLAIRE, and Michel BORDEAUX DIT BOURDON) encamped in the Bitterroot Valley. McClellan sent word to Thompson of the Northwest Company (then on the Columbia River) not to encroach on their Bitterroot trading territory. In the winter of 1807-08, eight men of the Bitterroot camp, including the leader John McClellan, were killed in a battle with Blackfeet or Gros Ventres. In early Spring, John COLTER returned from the Wind River region by way of the Snake River, Jackson Hole, and a route that took him through the Yellowstone Park area. Back in St. Louis, Colter's description of Yellowstone was disbelieved and the fantastic region was named "Colter's Hell." Colter traveled with a group of Crows and fought along side them when they were raided by Blackfeet, the Crows' traditional enemies. After 1808, the Blackfeet became enemies of the American traders in the mountains. John Colter rejoined the Lisa-Henry party at the mouth of the Big Horn on the Yellowstone. At this place, in Spring of 1808, the party constructed Fort "Raymond" (which was usually referred to as Ft. Manuel). George DROUILLARD, like Colter, was dispatched by Lisa from his Fort Manuel to explore the Big Horn basin in 1808. Colter and a man named POTTS left on a separate scouting expedition up the Jefferson River from the Three Forks region. They encountered 800 menacing Blackfeet who demanded they come ashore. Colter waded to land while Potts remained in the canoe. The Blackfeet shot Potts in the hip while Colter was stripped and robbed. Potts hollered that he was too wounded to escape-- that Colter should make a run for it while Potts could shoot at least one enemy. Potts did so, died in a hail of bullets and arrows, and was hacked to pieces and thrown in Coter's face. SOURCE: The Wreck of the Sv. Nikolai (Oregon Historical Society Press, 1985), by Kenneth N. Owens, editor, and Alton S. Donelly, translator, contains the journal of Timofei Tarakanov and the oral tradition narrative of Ben Hobucket, a Quileute, as well as a debunking of the fraudulent journal of "Vassilie Petrovich" (H.H. Bancroft's source); JOURNAL SOURCES: Robert Campbell (Campbell); David Thompson (Hopwood, narrative; Glover or Tyrell journal, 1784-1812; Coues, journal, 1799-1814); ON RUSSIAN AMERICA: ((Berkh, Rezenov). The Blackfeet told Colter to run, to give a sporting chance. Colter walked about hundred yards and then took off, out-running all but one warrior who kept with him half way to the Madison River. Colter killed this man with the head of his own spear. He hid from the rest of his pursuers behind a log in the river, swimming and floating away during the night. Clad only in the Indian's blanket and armed only with the spearhead, Colter walked 11 days back to the Yellowstone River. In July, Lisa returned by river to St. Louis while Henry stayed at the fort. Back in St. Louis, Manuel Lisa organized the Missouri Fur Company (partnered with Benjamin Wilkinson, Pierre Chouteau Sr., Auguste Chouteau Jr., Reubin Lewis, William Clark, Sylvestre Labbadie, Pierre Menard, William Morrison, and Andrew Henry). The American ships Derby, Capt. SWIFT, and Guatimozin, Capt. GLANVILLE, entered the Columbia River in 1808. Simon FRASER led an exploring expedition in the Northwest this year. Registre BELLAIRE, a former employee of the Missouri River trader Charles Courtin, was hired by David Thompson to work for the Northwest Company in the Columbia River region in 1808. Carlo CHATA (Charlot TseTse) also worked for Thompson between 1808 and 1810. In this year, or perhaps slightly later, Nicholas MONTOUR was placed in charge of Kootenay House. In 1808, the RUSSIAN AMERICAN COMPANY recaptured Sitka Sound from the Tlingits with help from Aleut allies. Continued Tlingit hostility convinced Chief Manager Aleksandr BARANOV to concentrate future Russian efforts to the south, beginning with the Oregon Country. Jocco FINLAY and his large family had an outpost near to Old Fort Kootenae but closer to the Blaeberry River. In April, after the death of the wife of one of Thompson's voyageurs, (Basile?) LUSSIER, Findlay took in the Lussier children. In August, Finlay and family took refuge with Thompson after their camp was raided by Piegan Blackfeet. David THOMPSON of the Northwest Company extended trading operations into the Flathead (that is Salish) region. Traders with Thompson in 1809 included the metis Michel BOURDEAUX DIT BOURDON, Michel KINVILLE, Francois SANS FACON, Francois GREGOIRE, Pierre GREGNON, and Francois RIVET. (Other names associated with Thompson at this time: Brucier, Pembrook [Pembuck? ], Bellaire, James McMillan, and Jean Baptiste Boucher). In October 1809, after a 200 mile journey, Thompson and his party set up a trading camp near the site of present-day Libby, Montana (later the site of Kullyspell House and later still Fort Kootenay). Soon they built and established Flathead Post (Salish House, present day Montana) south of Flathead Lake and near Clark Fork River to trade with the Salish and Pend d'Oreil Indians. Upon arrival, the Northwesters found about 20 metis (mixed white and Indian people, usually descendants of European/Canadian fur traders and Indian wives) already engaged in the fur trade in the Flathead region. This vanguard of Canadian emigration to the Northwest included the mixed-race clans of the Iroquois, emigrants from the Saskatchewan River region, and remnants of McClellan's 1807-08 American expedition into the Bitterroots. In territory that would later become Washington State, the SURVIVORS OF THE WRECK OF THE SV. NIKOLAI, tried to reach the coast after a miserable winter spent in the foothills of the Olympics. Anna Petrovna BULYGIN, the wife of the ship's navigator and captive of the Makah people, persuaded Bulygin, Timofei TARAKANOV, and a few others to surrender and take refuge with the Makah. At least three of the SURVIVORS OF THE NIKOLAI REACHED THE COLUMBIA RIVER in 1809. One, an un-named Aleut man, was ransomed by Capt. George Washington EAYRES (of the American ship Mercury) when he was offered for sale by his Indian captors on the bank of the Columbia River. Another, ship's apprentice Filip KOTELNIKOV, had been bought by Chinooks from the Hohs or Quileutes and apparently decided to remain with the Chinooks voluntarily. BOLGUSOV, another of the crew who had been sold to Columbia River Indians, was ransomed by Captain BROWN of the American ship Lydia in 1810. In spring of 1809, Andrew HENRY, field captain, Pierre CHOUTEAU, military commander, Pierre MENARD, company manager, and a party of Missouri Fur Company trappers set out from St. Louis to the Three Forks region of the Missouri River. Manuel LISA followed them up the Missouri in June, overtaking the flotilla of 13 barges and keelboats before they reached the Mandan Villages on the Upper Missouri. SOURCES: "David Thompson's Journey in Idaho" (his journal of Sept 1809 in Washinton Historical Quarterly, vol. 11, no. 2, April 1920); John C. Jackson's Children of the Fur Trade (Mountain Press Publishing Company, Montana, 1995) analyzes a huge number of primary sources (such as Hudson Bay Company archives and Harriet C. Duncan's 6-volume Catholic Church Records of the Pacific Northwest) to trace the history of Metis (part-Indian) French Canadians. David Thompson (Hopwood, narrative; Glover or Tyrell journal, 1784-1812; Coues, journal, 1799-1814); on the SV NIKOLAI (Owens). Thomas JAMES commanded a flotilla of 13 barges and keelboats. Pierre Chouteau (one of the fur company partners) escorted SHAHAKA, who had been brought to St. Louis by Lewis and Clark, back to his home among the Mandans. RUEBEN LEWIS (brother of Merriwether Lewis), Francoise VALLE, LABBADIE, MENARD, MILLER, MORRISON, one of Chouteau's sons and Thomas James (barge captain) also made the journey. Benito VASQUEZ (Lisa's second in command in 1807-1808) met them at the Mandan villages. Many of the Americans with the party dropped out and went back down river at this point. Lisa had recruited heavily among the Creoles of Detroit, St. Louis, and Kankaski and the original party was about half-and-half American and French. They had bickered all the way up river with Chouteau and Lisa the targets of the Americans' anger. (Henry and the small party of Americans that were with him remained neutral). After the company founded Ft. Lisa (often called Ft. Mandan) just upriver from the native Mandan villages, arguments came to a head. When Lisa and Chouteau refused to give the Americans promised trapping equipment, one man threatened them with death. The commanders confiscated all the guns and the Americans camped outside the new fort. When Chouteau ordered his men to fire upon the Americans, Henry, Valle, Sylvestre Labbadie, Pierre Menard, William Morrison, and Chouteau's son placed themselves bodily between the hostile factions. Chouteau returned to the fort with no shots fired. The Missouri Fur Company was now ready to begin operations. Thomas James, MCDANIELS, and Miller had left to trap two days before the big argument. Henry went quickly overland to Ft. Manuel (Raymond) while Menard, most of the men, and the supplies voyaged upriver to meet him. While Henry and the trappers wintered at the fort (at the mouth of the Big Horn on the Yellowstone River) Manuel Lisa and Pierre Chouteau returned to St. Louis. John Jacob ASTOR received a charter in New York to form the AMERICAN FUR COMPANY in 1809. In 1810, Indians on the Columbia River shore offered to sell BOLGUSOV, a survivor of the wreck of the Sv. Nikolai, as a slave to CAPTAIN BROWN of the American ship Lydia. Brown ransomed Bolgusov and sailed north to the territory of the Makahs where the other survivors were held captive. On May 6, 1810, the Lydia anchored off the coast of the Olympic Peninsula near Cape Flattery and Neah Bay. Brown negotiated the release and ransom of the 13 captives and set out northward for New Archangel, Alaska, arriving June 9, 1810. The 13 ransomed were Timofei TARAKANOV, Dmitrii SHUBIN, Ivan BOLOTOV, Ivan KURMACHEV, Afansii VALGUSOV, Kasian ZYPIANOV, Savva ZUEV, Abram PETUKOV, John WILLIAMS (American), two Aleut men, and two Aleut women. Navigator BULYGIN and wife Anna Petrovna Bulygin died in Makah captivity. Five others died in battles with the Quileute or Hoh or died in captivity: IAKOV PETUKOV, Kozma OVCHINNIKOV, Khariton SOBACHNIKOV, and two Aleuts. One Aleut man and a Russian named BOLGUSOV were ransomed on the Columbia River by American captains. Another, naval apprentice Filip KOTELNIKOV, apparently decided to stay voluntarily with the Chinooks on the Columbia River. Some of the Nikolai passengers had developed affection for their captors. One captive rescued from the Quileutes (an Aleut woman) was brought along on a later expedition sent to punish and enslave the Quileute; she called out to them from the ship and warned away their canoes. YUTRAMAKI (or Machee Ulatilla), a Makah chief, was particularly praised for his nobility and protection. In 1805, this same Yutramaki had arranged for the release of American John JEWETT from Nootka captors. May 26 through July 19, 1810: In spring of 1810 Capt. Nathan WINSHIP of Boston and a small crew arrived in the trading ship Albatross and attempted to establish a post on the Columbia River on an island about 3 miles from the present day site of Quincy, OR (at Oak Point about 40 miles from the mouth of the Columbia). Winship intended to leave a small party under the leadership of a man named WASHINGTON to stay the winter. Instead, during construction of the post, Winship imprisoned some Chilwitz (Echeloot) men mistakenly believing they were the party who had attacked the Russian post at New Archangel (Alaska). As the Chilwitz prepared for war, Winship and his crew retreated down the Columbia. A party of trappers with the NORTHWEST FUR COMPANY set out from the Hudson Bay fort region for an expedition to the Pacific. They were led by David THOMPSON on a route through the Athabasca Pass (through a region named later as Alberta Province along the border of British Columbia). By 1810, Jacco FINDLAY had rejoined the Northwest Company and worked as a clerk under Finan MCDONALD at Salish House. During the summer of 1810, Salish Indians with the Northwest Company's BOURDON, Jean Baptiste BOUCHE, Jacco FINDLAY, and Finan MCDONALD crossed the Rockies heading east. The company held off an attack by Pikuni Blackfeet, retreated, and built the stronghold of Spokane House (near the junction of the Spokane Riverand the Little Spokane, present-day Washington State). Meanwhile, David Thompson and a party had traveled east of the Rockies. In the summer of 1810, Piegan Blackfeet had unsuccessfully fought a force of 150 Nez Perce and Flatheads on the plains (some of whom, unlike the Piegans, had received guns in trade from the Northwesters). The hostile Piegans blocked Thompson's usual route over the Rockies. He crossed on a more northerly pass, traveled south along the Kootenai and Pend d'Oreil rivers, and arrived at Spokane House in June 1811. Guided by John COLTER, Andrew HENRY, Pierre MENARD, and most of the trappers who had wintered at Fort Manuel traveled to the Three Forks region in April 1810 for trapping and trade with local Indians. Five men were killed in an attack by an estimated 200 Blackfeet of the Kiniah tribe (also called Bloods). In another skirmish on the Jefferson River, one American lost his life as the trappers killed 22 Blackfeet. George DRUILLARD, who was trapping with a group of 21 men, was killed in yet another battle. Henry, Menard, and their men retreated over the pass to the Yellowstone. At the mouth of the Clark River on the Yellowstone they met a large party of friendly Crows. Here they cached their goods and divided into two groups, the men with Menard traveling back to Ft. Manuel (also called Ft. Raymond, at the mouth of the Big Horn) and those with Henry west to the Madison River. Henry and his sixty men passed through a low divide to the south (Bozeman Pass) and crossed over the Tetons to the headwaters of the Snake River. Spying abundant beaver, they built a fort just downstream of a lake on Henry's Fork (site of present-day St. Anthony, Idaho). Archibald PELTON became separated from Henry's company somewhere along the Fork (He would not be seen again until 1811). Although the beaver were plenty, the high elevation meant game was scarce and the men endured a starvation diet. John HOBACK, Edward ROBINSON, P. MCBRIDE, Jacob REZNOR, B. JACKSON, and L. CATHER were among those wintering over at the miserable Ft. Henry. With his eastern Rockies-based American Fur Company driven out of business by competition from the MACKINAW COMPANY in the north and the Missouri Fur Company and others in the south, JOHN JACOB ASTOR formed the PACIFIC FUR COMPANY to pursue the fur trade from west of the Rockies. Astor dispatched one party by ship from New York and another overland from St. Louis in 1810 to begin operations for the Pacific Fur Company. SOURCES: ON RUSSIAN AMERICA (Owens, Berkh, Rezenov); on the NORTHWEST COMPANY: Wallace, W.S., Documents Relating to the Northwest Company, 1934, Champlain Society, Toronto; David Thompson (Hopwood, narrative; Glover or Tyrell journal, 1784-1812; Coues, journal, 1799-1814); John C. Jackson's Children of the Fur Trade (Mountain Press Publishing Company, Montana, 1995) analyzes a huge number of primary sources (such as Hudson Bay Company archives and Harriet C. Duncan's 6-volume Catholic Church Records of the Pacific Northwest) to trace the history of Metis (part-Indian) French Canadians. "Roll of the Overland Astorians, 1810-1812" (OHQ 1933); [The roll of the overland Astorians 1810-12 appears in Oregon Historical Quarterly #34 as well as the trail journal of Robert Stuart]; On the ship Tonquin, Robert Stuart, Thomas and Alexander McKay; on the trail William P. Hunt (Franchere). The original Pacific Fur Company partners were John Jacob Astor of New York, an American from New Jersey named William Price HUNT and three former members of the Canadian Northwest Fur Company, Alexander MCKAY, Duncan MCDOUGAL, and Donald MACKENZIE. In 1810 the two parties representing ASTOR'S PACIFIC FUR COMPANY, set out to establish the first trading post on the Columbia River. One party sailed from New York on the ship Tonquin, under the command of Captain Jonathan THORNE. The other party set out overland from St. Louis led by William Price HUNT. Both parties expected to arrive at the mouth of the Columbia River at about the same time. Astor also dispatched the ship Beaver with a load of supplies and some additional workers for the company. Astor's ship, the TONQUIN, put to sea on September 8, 1810. Aboard were Captain Jonathan THORNE, fur company partners Alexander MCKAY, Duncan MCDOUGAL, David STUART, his nephew Robert Stuart, 12 clerks, and enough voyagers to make a crew of 20. In Hawaii, 20 to 30 Hawaiians joined the Tonquin for the voyage to Oregon. Astor's overland expedition to Oregon was led by William Price HUNT with partner Donald MACKENZIE. MacKenzie and Hunt left Montreal by canoe and arrived at Mackinaw (at the confluence of lakes Michigan and Huron) on July 23, 1810. Ramsey CROOKS (a Scotsman) joined them at Mackinaw and the party headed down river to arrive at St. Louis September 3, 1810. (Their journey took them via Green Bay to the Fox River, then the Wisconsin River to Prairie du Chien and on to the Mississippi River). Meanwhile, Pierre MENARD came downstream from Ft. Manuel and reached St. Louis in September. His report to the Missouri Fur Company was so discouraging that the partners decided not to send new supplies to Andrew Henry and his trappers. Instead, they planned to dispatch a small rescue party come Spring. AT ST. LOUIS, HUNT and the Pacific Fur Company party recruited Joseph MILLER as a partner (he was a fur trapper from Maryland--Bancroft's Oregon, vol. 1, says Miller, who came west with Henry, met Astorians in Idaho; otherwise he would have had to have returned to St. Louis from Ft. Manuel, as Menard did). The Pacific Fur Company partners and men departed From St. Louis October 10. 1810 to establish winter quarters up the Missouri River. At Nodowa, the site of their winter camp, Robert MCCLELLAN (a war veteran) and John DAY (a hunter from Virginia) joined the Astorian party. In late 1810, the Missouri Fur Company's Cedar Post accidentally burned with $12,000 to $15,000 worth of furs. ASTOR bought out the Mackinaw Fur Company in 1811 and added it to his holdings in the American Fur Company and the Pacific Fur Company. Briefly, just until the War of 1812, Astor's merger of the Mackinaw and the American fur companies operated under the name the SOUTHWEST FUR COMPANY but revived after the war as the AMERICAN FUR COMPANY. On March 25, concerned about Astor's operations, the Missouri Fur Company partners met in St. Louis to discuss the rescue party that they had planned during the previous September. The CHOUTEAUs withdrew their financial backing and only partners Manuel LISA, William CLARK, and Pierre MENARD supported the transport of reinforcements and supplies to aid Andrew Henry and his men. Lisa was to lead the rescue party and await Henry and his trappers at the Mandan villages. After wintering at Ft. Henry (Idaho), MISSOURI FUR COMPANY members under Andrew HENRY abandoned the post to go east in the spring of 1811. Several men remained to trap in the mountains. One group under Henry went northeast to Ft. Manuel (officially named Ft. Raymond) by way of the Yellowstone River. The other party traveled to Jackson Hole, over Togwotee Pass (Lewis and Clark's route), and then perhaps down the Wind River and Big Horn to reach Ft. Manuel via the Yellowstone River. At the Fort, the trappers found that no supplies had been sent by the Missouri Fur Company partners in St. Louis. On New Year's Day, 1811, W.P. HUNT left the Astorians' winter camp (called Nadowa) on the Missouri River with 5 men to return to St. Louis. In St. Louis, Manuel LISA of the Missouri Fur Company was recruiting men for a rescue party so supplies and new recruits were scarce. Hunt was able to hire Pierre DORIONE as guide and Sioux interpreter, but only two of the five men who accompanied him to St. Louis returned (Dr. John BRADBURY, a botanist of the Linnean Society of Liverpool and Thomas NUTTALL, a scientist). In Spring 1811, on his way back up the Missouri River to winter camp (at Nowdowa) Hunt encountered Daniel BOONE (then 85 years old) and John COLTER. The Pacific Fur Company under Hunt, left Nodowa Village for their journey to Oregon on March12, 1811. Hunt and his party of 60 reached the Platte River on April 28, Omaha Village on May 10, and just below the Arikara Village (near the mouth of the Grand River on the Missouri) on the first of June 1811. Lisa and his rescue party were already encamped. Lisa, his boat, and a crew of 21 set out from St. Louis on April 2, slightly behind the Pacific Fur Company party. With him were Henry Marie BRECKENRIDGE and a couple returning to the Hadatsa Village; Toussaint CHARBONNEAU and SACAJAWEA were going home after a visit with William Clark in St. Louis. Lisa steadily gained on Hunt's party as he and his crew made way up the Missouri. They passed the mouth of the Platte on May 10, the Omaha Village on May 19. At this point, Hunt was only four days ahead. On May 23, Lisa met F.M. BENOIT who had come downriver (Benoit was the Missouri Company's chief factor at the Mandan Villages, upriver near the mouth of the Big Knife River). Benoit reported that all Indians except the Arikaras and the Mandans had become the Americans' enemies. The Sioux, said Benoit, had killed several Americans in the Mandan vincinity. Three days later, on May 26, two of Hunt's men who had been dispatched by him to go back downriver reached Lisa with a message: Hunt was only one day away and would wait for Lisa and his company at the Ponca Village (mouth of the Niobrara river, now northeast Nebraska). Lisa also encountered two deserters from Hunt's party who told him that Hunt had placated hostile Sioux by promising the Indians that Lisa was on his way with goods for them. SOURCES: William Price Hunt, journal (Franchere and in Thwaites, vol.6); Thomas Nuttall, travel books (published in the early 19th century and available at the Bancroft Library: Travels into the Old Northwest, ; Travels in North America, ; "Journal," Oct. 1818 to Feb. 1820; Journal of Travels [Arkansas], 1819; Nuttall, a botanist and orinthologist, came to Oregon on the Trail in 1834--after he returned to the east, he published a book on his travels in Oregon, Hawaii, and California, 1834-35); Brackenridge, Henry Marie, Views of Louisiana, Readex Microprint, 1966; Bradbury, John, Travels in the Interior of America, Readex Microprint, 1966. Journals by William P. Hunt (Franchere), Ross Cox (Stewart), Alexander Ross (Ross wrote Fur Hunter of the Far West; excerpts in OHS VF--from the Oregonian newspaper, 1885; also OHQ 1913); David Thompson (Hopwood, narrative; Glover or Tyrell journal, 1784-1812; Coues, journal, 1799-1814); "Matthews' Adventures on the Columbia" (OHQ 40); Gabrielle Franchere's journal of a voyage arriving in Oregon this year (Quaife); in this year, Robert Stuart was in Oregon--he arrived on the ship Tonquin (Rollins, editor--Stuart's journal begins in 1812 but recounts past events); Thomas McKay was in Oregon, arriving on the Tonquin (William Cameron McKay Papers [son of Thomas McKay] are in the Pendleton Public Library, Oregon); material about the NORTHWEST COMPANY: Wallace, W.S., Documents Relating to the Northwest Company, 1934, Champlain Society, Toronto. Meanwhile, on the same day, three of Andrew Henry's men (Jacob REZNOR, Edward ROBINSON, and John HOBACK) came to Hunt's encampment from Ft. Manuel (on the Yellowstone River). The three joined Hunt's party as guides. Hunt and the Astorians (Pacific Fur Company) found Lisa and his Missouri Fur Company rescue party already encamped when they arrived at the Arikara Village (at the mouth of the Grand River). From here, Lisa continued upriver and arrived at the Mandan Villages on June 26. Reubin LEWIS was waiting there for him but the rest of Henry's company did not arrive at Ft. Lisa (more commonly called Ft.Mandan) until September. Lewis told Lisa that Henry was on his way with a huge catch of furs. Henry, Lisa, Benoit and others returned downriver to St. Louis in the Fall of 1811. On their way back, they rebuilt the trading post on Cedar Island. From the Arikara Villages, Hunt and the Astorians departed from the Missouri River overland on July 23, 1811. To avoid hostile Blackfeet, the three guides (formerly Andrew Henry's men) convinced the party to go west by way of Union Pass rather than the more northerly route of Lewis and Clark (Togwotee Pass). Pierre DORIONE, Alexander CARSON, and GRADPIE traveled ahead and lost the main party. The party with Hunt, by veering sharply westward, rejoined them at the Little Missouri River in mid-August. The Astorians with Hunt reached Ft. Henry on October 8, 1811. At the deserted Ft. Henry (westernmost Wyoming), Louis ST. MICHEL, Pierre DELAUNEY, Pierre DETAYE,and Alexander CARSON were instructed to trap for furs and then make way to the Columbia River. (Francois LANDRY, Andre LACHAPPELLE and Jean TURCOTTE may also have left the party here or further west near the Mad River). John HOBACK, Jacob REZNOR, and Edward ROBINSON (who were traveling west with the Astorians as guides) rejoined the remnant of the party that came west with Andrew Henry in 1810. These men stayed to trap in the Bear River region as the Pacific Fur Company proceeded toward the Columbia River. (This party may have included a man named CASS and Joseph MILLER, if he had not met the Astorians in St. Louis as reported in some sources. One source, Jackson's Children of the Fur Trade, says that William CANNON and DUBRIEUL were also left by the Astorians to hunt in the Snake River region in 1811). A trapper with the Astorians named CLAPPINE drowned in a canoe accident near Caldron Linn in late October 1811. Hunt's company cached supplies and furs at this place on the Snake River (between the American and Shoshone Falls) and headed for Oregon. At the Lewis River, they found the long lost Archibald PELTON who had become separated from Henry's expedition the year before. Pelton appeared to be out of his mind but fortunately had been taken in by Snake Indians (Shoshones). The route westward was unclear and Hunt's company split up. John REED led one party. Eighteen men under under HUNT and Pierre DORION followed after. Ramsey CROOKS led another 18. Crook's party reunited with Hunt and company on December 6, 1811. The rest of the Astorians together with John Reed, Donald MACKENZIE,and Robert MCCLELLAN, were by this time well ahead of Hunt's combined company. At this point, Hunt left CROOKS and John DAY (then ailing) to make their way slowly along the Columbia River while Hunt's company doubled back to the last place where they had been able to find and purchase provisions (Woodpile Creek). On December 29, Madame DORION, wife of Pierre Dorion and mother of four- and two-year-olds (all on the expedition) gave birth to a healthy baby. Hunt, Dorion, and company resumed the journey westward on January 2, 1812. THE SHIP TONQUIN ARRIVED AT THE MOUTH OF THE COLUMBIA on March 22, 1811. (It put to sea from New England September 8, 1810). Eight men, the crews of two small boats, were drowned during attempts to locate a channel across the bar during stormy weather. Donald MCDOUGAL and David STUART went ashore at a landing site at Baker Bay to scout on April 5, 1811. They returned to the ship with Chief COMCOMLY of the Chinooks on April 12 and reported a better site for a post at a spot later named George Point. Captain THORNE set some of the crew and a small portion of the supplies ashore and sailed to Vancouver Island. Rather than begin trade with the Native Americans on Vancouver Island (at Clayoquot Bay), Thorne so antagonized them that they attacked the Tonquin. All on board were killed and the Tonquin burned, exploded, and sank to the bottom with all supplies. An Indian interpreter named JOSEACHAL (a Quinault) returned to Ft. Astor, the sole survivor of the WRECK OF THE TONQUIN. Joseachal said that four survivors of the original attack had holed up in the cabin of the Tonquin with a severely wounded clerk, James LEWIS. Lewis told them to escape and then ambushed Neeweetee (that is, Nootka or Clayoquot) Indians still aboard by setting fire to the ship's store of ammunition. The three other survivors were later captured and killed while the interpreter made his escape. The shore crew on the Columbia River could only hope for a speedy arrival of the overland party and began work on FT. ASTOR. David STUART set out with 6 men of this company to establish another post beyond the upper Columbia (on the Okanagan River in territory that would later be Washington State). Stuart's party met a Pacific-bound expedition led by David THOMPSON during their journey up the Columbia River. Thompson, an employee of the Northwest Fur Company, continued with his party down the Columbia, set up camp outside Ft. Astor, and established a presence for the NORTHWEST FUR COMPANY. In summer of 1811, David THOMPSON, Michel BOURDON, BOULARD, Ignace L'IROQUOIS, and others of a Northwest Company boat-party arrived at Ft. Astor after travel down the Columbia River. Boulard, who was ill, stayed at the fort and was replaced by a Hawaiian named COX for the return journey. Those paddling up river with Thompson also included Maurice PICARD, Thomas CANASWAREL, and Ignace SALIAHONE who had left his family at Ft. Astor. (Thompson was at Spokane House on June 14, 1811; at Ft. Astor August 6; back to Spokane August 13 where he met Jacco FINDLAY; and to Salish House by November 11). In November, Thompson left Cox and Paul "Iroquoi" with Jocco FINLAY at Spokane House. He also ordered Michel KINVILLE to abandon his charge of Lake Indian House and move all company goods to Spokane House. On September 26, 1811 the Astorians had completed quarters built of stone and clay. On October 2, they launched a new small schooner and named her Dolly. A detachment from David STUART's post on the Okanagan arrived on October 5, 1811; David Stuart had sent half the company back to Ft. Astor while he and the rest wintered over at the Okanagan post. Registre BRUGIER may have been with this party or with another Pacific Fur Company party that returned to Ft. Astor in October 1811. At the fort, Gabriel FRANCHERE recognized Brugier from their previous association in the Iroquois trade out of Saskatchewan. Astorians with William Price HUNT left their camp at the lower Snake River on January 2, 1812 and reached the confluence of the Walla Walla and Columbia rivers on January 21, 1812. At about this date in January, Donald MACKENZIE, Robert MCCLELLAND, and John REED arrived at Ft. Astor with a portion of the OVERLAND PACIFIC FUR COMPANY (ASTORIAN) EXPEDITION. Those with William Price Hunt arrived about a month later on February 15, 1812 (they had camped at Wishram Village, Celilo Falls, on January 31 and made the rest of the journey by canoe). Only 35 members of the original Astorian party of 59 overlanders reached the mouth of the Columbia River. Sickness, starvation, drownings, hostile Indians, fatigue and desertions took their toll during the 17 months of travel. Ramsey CROOKS and John DAY had been seen by neither party since December 1811. Meanwhile, the Astorians left behind to hunt IN IDAHO traveled mostly northeast towards the Missouri River. While a party of four was on its way north towards the Missouri headwaters in late 1811 or early 1812, Pierre DETAYE was killed by Crows. Alexander CARSON, Pierre DELAUNEY, and Luis ST. MICHEL had also been attacked but reached the Missouri River region. Others with the Astorian fur trappers--Francois LANDRY, Andre LACHAPPELLE and Jean TURCOTTE--traveled with a party of Shoshones who were attacked by Blackfeet while traveling northeast from the Snake River. This party retreated to the Snake River at Caldron Linn. During portage at Deschutes, REED and his small party of companions were attacked by Indians. Two of the attackers were killed and the others driven off. In the melee, Reed was severely injured by tomahawk blows to his head and the dispatches were lost. All three parties of Astorians changed their courses to go to David Stuart's post on the Onkanagan River. David STUART joined them for the return trip to Ft. Astor. Along the Columbia River, the party found the long-missing John DAY and Ramsey CROOKS. At the end of the previous year, Walla Walla Indians had taken in and sustained the two men. When they resumed their journey to the mouth of the Columbia River in 1812, traveling alone, they had been attacked by another tribe of Indians near Deschutes. They were uninjured but robbed of every supply. The company returned to Ft. Astor on May 11, 1812. Meanwhile, May 6, 1812, the Astorian SUPPLY SHIP BEAVER arrived at the Columbia River. By the end of June, the Astorians were ready to make a new attempt at trading expeditions. This time ROBERT STUART led the party bound for the States including John DAY, Andrew VALLE, Ramsey CROOKS, Benjamin JONES, Robert MCCLELLAN and Francois LECLAIRE. DAVID STUART went to establish a new post (300 miles beyond Okanagan) and parties with Donald MACKENZIE, Ross COX, and John CLARKE went to explore the upper Snake River region. Once again, all the Astorians traveled together up the Columbia River. At the junction of the Walla Walla and Columbia Rivers, on July 31, 1812, ROBERT STUART AND HIS PARTY SET OUT OVERLAND FOR THE STATES (see the section titled "West to East" below for the chronology of this journey). DAVID STUART traveled north to establish another post 300 miles beyond Ft. Okanagan. Donald MACKENZIE, John CLARKE, and Ross COX parted company at the juncture of the Clearwater River and the Snake. John Clarke's party went up the upper Snake and the Lewis River to make a post at Spokane. [This post called Spokane Fort was just a half mile from the Northwester's Spokane House (established 1810)]. Meanwhile MacKenzie's company canoed the Lewis River to the Sahaptin River and made camp among the Nez Perce. Ross Cox (Stewart), Alexander Ross (Ross wrote Fur Hunter of the Far West; excerpts in OHS VF--from the Oregonian newspaper, 1885) and "Journal of Alexander Ross--Snake Country Expedition" (OHQ 1913); Robert Stuart (Rollins), David Thompson (Hopwood, narrative; Glover or Tyrell for Thompson's journal, 1784-1812; Coues, journal, 1799-1814). The summer INDIAN RENDEZVOUS of 1812 in Oregon (at the confluence of the Columbia and Walla Walla rivers) included David THOMPSON, David STUART, and Alexander ROSS. Ross reported that this traditional trading meet attracted about 1500 Cayuses, Walla Walla (Palouse), and other Shehaptin Indians (Indians of the Plateau region). He also estimated 400 horses. David Stuart and other Astorians joined David Thompson (of the Northwest Fur Company) for the return trip down river to Ft. Astor. In August 1812, W.P. HUNT and the ship Beaver left Ft. Astor to pursue the fur trade along the north coast. Duncan MCDOUGAL, left in charge of the fort, expected their return in October. From his Shahaptin River camp, MacKenzie dispatched John REED and a small party to go east to the cache at Cauldron Linn on the lower Snake River. In the Caldron Linn region, Reed encountered Pacific Fur Company trappers who had wintered east of the Blue Mountains (Alexander CARSON, Louis ST. MICHEL, Pierre DELAUNEY, Joseph LANDRY, Andre LACHAPELLE, and Jean TURCOTTE). All the trappers headed back to MacKenzie's camp on the Shahaptin River with the sad news that the Caldron Linn cache had been thoroughly plundered. John CLARKE, Ross COX, and Donald MACKENZIE reunited at Spokane House (Clarke's post) in the fall of 1812. Here they received news of the War between the United States and Britain. The news had been brought by John George MCTAVISH who had come from Lake Winnepeg OVERLAND WITH MEN OF THE CANADIAN NORTHWEST FUR COMPANY. In November or December 1812, Ross COX and Russell FARNHAM left the Flathead country to hunt buffalo in the Upper Missouri region. Buffalo-hunting Salish (one of the tribes often called "Flatheads") were now accompanied by fur traders on the Indian's traditional incursions into Blackfoot territory; this caused frequent skirmishes and brought Americans and Canadians further into conflict with the Blackfeet. In late 1812 or very early 1813, MacKenzie returned to Ft. Astor. David Stuart sent some of his company back to the mouth of the Columbia but he himself wintered at Okanagan. After conference with Duncan MCDOUGAL at Ft. Astor in January 1813, MACKENZIE and a party of men once again traveled up the Columbia, this time to confer with David Stuart and John Clarke about the news of war and the failure of the ship Beaver to return as scheduled. Because of native hostility to Europeans and Americans in territory south of Alaska (and because of the increasing presence of British and Americans in Oregon) the RUSSIAN AMERICAN COMPANY abandoned all attempts to create trading outposts in the Oregon Country. Instead, Ivan KUSHKOV founded ROSS COLONY in California in 1812, an outpost that remained until 1841. Meanwhile during summer and fall of 1812, Robert STUART and 6 men continued their OVERLAND JOURNEY BACK TO ST. LOUIS from Oregon. Near the mouth of the Willamette River, John DAY became too mentally deranged to continue the journey. Stuart disarmed him and sent him back to Ft. Astor under the care of Wapato Island Indians. By August 20, Stuart and company had reached Hunt's former camp on Woodpile Creek. In western Idaho on August 25, Stuart's party encountered some of the men who came overland with the Pacific Fur Company in 1811 and with the Missouri Fur Company in 1810: John HOBACK, Edward ROBINSON, Jacob REZNOR, and Joseph Miller (Martin CASS had been with them during the winter). One of the four fur trappers encountered in western Idaho, Joseph MILLER, joined the Astorian caravan for the journey back to St. Louis. By August 29, 1812, they reached Cauldron Linn and discovered that the caches of supplies left the year before had been plundered. On September 18 the party passed "Mad River" [from Stuarts' journal, probably Madison River]. The returning Astorians discovered South Pass through the Rocky Mountains and traveled as far east as Chimney Rock in 1812. They retraced their steps westward to the Nebraska-Wyoming line and then spent three miserable months wintering over before setting out again for St. Louis. While Astorians with Robert Stuart journeyed back to the States, Donald MCKENZIE, David STUART, and John CLARKE explored the upper Columbia River region. Astor sent the SHIP LARK (a supply ship for Ft. Astor) from New York in March 1813. It would never reach Oregon but sank in a storm off the coast of Hawaii late in 1813. The same month, on March 25, 1813, the British dispatched two ships from England, the Isaac Todd and the Phoebe, under secret orders to destroy any American settlement on the Columbia River or the Pacific Coast. The ships Raccoon and Cherub joined them during the voyage as the slow-sailing Todd slipped farther and farther behind. The Raccoon was sent ahead to the Northwest as the other BRITISH WARSHIPS battled and defeated the American ship Essex off the coast of Valparaiso, Chile. On January 10, 1813, Manuel LISA and Andrew HENRY met with others in St. Louis to reorganize the Missouri Fur Company. The enterprise had been profitable but the War of 1812 and Indian trouble made the venture very risky. A militia was created in Missouri (then under Governor William Clark) because of the War. The First and Third Battalions included names familiar in the fur trade: Andrew HENRY (Commander, 1st); Jacob PETIT (Captain, 1st); William JAMES (Lieutenant, 1st); Benjamin HORINE (Ensign); Robert BROWN (Captain, 3rd); James H. MOUTREE (Lieutenant, 3rd); and Drury GOOCHE (Ensign, 3rd). Baptiste ROI and Francois DORUIN traveled from St. Louis to the Otoe village (present day Yutan, Nebraska) in spring of 1813. Major Eli CLEMSON was in charge at Ft. Osage. On April 30, 1813, ROBERT STUART AND THE PACIFIC FUR COMPANY TRAVELERS ARRIVED IN ST. LOUIS from Oregon. Their route through Idaho and Wyoming was almost precisely the path later followed by the Oregon Trail. Donald MACKENZIE had returned from inland Oregon to Ft. Astor with news of the war between the US and Britain. After conference with Duncan MCDOUGAL at the fort in January 1813, MacKenzie, Alfred SETON, John REED and a party of 17 men once again traveled up the Columbia to return to MacKenzie's encampment on the Shahaptin River. MacKenzie also carried letters from McDougal for David STUART and John CLARKE about the news of war with Britain, the failure of the ship Beaver to return as scheduled, and the possibility of ending Pacific Fur Company business in Oregon. John C. Luttig, journal on the Upper Missouri, 1812-1813 (Drumm); Robert Stuart, journal of west to east journey on the Oregon Trail (Rollins). Alexander Ross (Ross wrote Fur Hunter of the Far West; excerpts in OHS VF--from the Oregonian newspaper, 1885) and "Journal of Alexander Ross--Snake Country Expedition" (OHQ 1913); Peter Corney's Early Voyages in the Pacific Northwest, 1813-1818; David Thompson (Coues, journal, 1799-1814); William P. Hunt, journal of journey west to east (Franchere). On the NORTHWEST COMPANY: Wallace, W.S., Documents Relating to the Northwest Company, 1934, Champlain Society, Toronto; John C. Jackson's Children of the Fur Trade (Mountain Press Publishing Company, Montana, 1995) analyzes a huge number of primary sources (such as Hudson Bay Company archives and Harriet C. Duncan's 6-volume Catholic Church Records of the Pacific Northwest) to trace the history of Metis (part-Indian) French Canadians. At the Deschutes portage, where Reed had been attacked the previous year, MacKenzie and two volunteers tried to demand the return of Reed's rifle from Indians encamped there. The chief refused to smoke the pipe of peace during uneasy negotiations and MacKenzie felt threatened. He was able to trade a blanket and ax for the rifle and retreat in safety. Shortly after passing Deschutes on the Columbia River, MacKenzie's party encountered John George MCTAVISH and two boatloads of Canadians then on their way downriver to Ft. Astor. The two parties camped together overnight and then proceeded in opposite directions on the Columbia. MacKenzie arrived at his encampment to discover that his caches had been plundered of all trading goods and furs. He dispatched parties to search for the thieves and another, under John REED, with messages for Clarke and Stuart. On May 25, John CLARKE and a party of men with 28 horses left the encampment at Spokane and Lewis rivers. On May 30, at the confluence of the Pavion and Lewis rivers, the party stopped to retrieve and repair canoes left with Indians at their camp. Clarke's silver goblet was stolen and he threatened to hang the chief. The next night, when another Indian was caught stealing goods, Clarke promptly "tried" and hanged the thief. Clarke's violent act, condemned by David Stuart and Donald MacKenzie, caused much upset among the various tribes gathered for summer INDIAN RENDEZVOUS at the confluence of the Walla Walla and Columbia rivers. At this rendezvous, attended by Stuart, MacKenzie, Clarke and others of the Pacific Fur Company, Alexander Ross recorded the statement of TUMMEATAPAM: "What have you done my friends. You have spilt blood on our lands." The Pacific Fur Company trappers returned to Ft. Astor from Indian rendezvous on June 12, 1813. Some who had originally intended to go to trade on the inland plains instead returned to Astoria. A group of 20 with David STUART and Keith was attacked while making portage at the Cascades. Stuart was wounded by arrows and their goods stolen but the party returned with their lives to Ft. Astor. In mid-July, John G. MCTAVISH and his party of men from the Northwest Fur Company left Ft. Astor to begin an overland journey back to Canada. Shortly after, in August 1813, William P. HUNT and some of the crew of the Beaver finally returned to Ft. Astor after nearly a year without communication with the fort. In 1812, the Beaver had an accident in a storm off of Alaska and had limped into Hawaii for repairs. Hunt chartered another ship, the Albatross, for his much delayed journey back to Oregon. The news of the War of 1812 had also reached Hawaii by this time. The Pacific Fur Company partners sold Ft. Astor to the Northwest Company in October 1813, much influenced by news of the war and ships dispatched from England to take Ft. Astor. Afterwards, the Albatross returned to Hawaii and (at Ft. Astor) Pacific Fur Company partner MCDOUGAL changed his allegiance to the Northwest Fur Company. While McDougal remained at Ft. Astor, Alexander ROSS and a party went to Walla Walla country. Former Northwest Company employee, Registre BELLAIRE, and former Astorians John DAY, William CANNON, and Alexander CARSON worked together as free trappers along the Willamette in the winter of 1813-14. Employees of the Northwest Fur Company who wintered 1813-14 at Ft. Astor included Iroquois Pierre CAWANARDE, Thomas OCANASAWARET, Jacques OSTISERICO, Etienne OWAYAISSA, Jacques SHATACKOANI, Ignace SALIOHENI and George TEEWHATTAHOWIE. J. SAGANAKEI, a Nipissing, and M. MANICQUE, a Wyandot, were also at the fort. Thornbun FINDLAY and Raphael FINDLAY Jr. (sons of the Northwest Company's Jacco Findlay) were employed by Ft. Astor (later called Ft. George) from 1813-14. When the British warship Raccoon (Captain BLACK) arrived at Ft. Astor, Dec. 12, 1813, the Fort was already in British hands. The British officially took charge of Ft. Astor on December 13, 1813 in a flag raising ceremony held by the captain of the Raccoon. Ft. Astor was officially renamed FT. GEORGE and became an outpost of the Northwest Fur Company. Back in Hawaii on December 20, 1813, HUNT met the survivors of the ship Lark. THE LARK, sent by Astor from New York to resupply Ft. Astor, had sunk in a storm off of Hawaii before ever reaching the Columbia River. The British ship Raccoon sailed way from Ft. Astor on New Years Day, 1814 after re-naming the post FT. GEORGE and raising the British flag. * Alexander Henry, journal (Coues); on the NORTHWEST COMPANY: Wallace, W.S., Documents Relating to the Northwest Company, 1934, Champlain Society, Toronto. *See earlier entries for journals kept by Astorians and Northwest Company explorers. Alexander Henry Jr. (called the Younger), a Company clerk, arrived in Oregon by ship in 1814 and kept a journal this year (Gough, journal 1799-1814); David Thompson (Coues, journal, 1799-1814). On January 20, 1814, 85 men in 18 canoes set out from Ft. George to avenge the attack on Stuart's party at the Cascades portage the previous year. The Northwesters anchored at the foot of the rapids to begin negotiations. John G. MCTAVISH led four days' of negotiations demanding return of stolen property while the Cascade chiefs demanded the trappers turn over the men who had killed two of the tribe. The trapper company retreated to the fort on the fifth day after being robbed during the night. In Hawaii, HUNT obtained the brig Pedler and sailed for Oregon with Capt. NORTHROP, and the survivors of the wreck of Astor's ship, the Lark. At Ft. George (formerly Ft. Astor) on February 28, 1814, the Pedler took aboard those Americans unwilling to join the Northwest Company and sailed for New York, April 14, 1814. Former Pacific Fur Company partners MACKENZIE, CLARKE, and STUART soon set out from Ft. George overland. MacKenzie traveled to the Willamette River while John Clarke and David Stuart returned to their posts north of the Columbia River. On April 17, 1814, the British ship Issac Todd arrived at Ft. George at Astoria (the modern name for the region). Donald MCTAVISH took charge of Ft. George (formerly Ft. Astor) and planned to travel overland to Montreal after order had been established at Astoria. McTavish and his clerk, Alexander HENRY Jr., were drowned attempting to reach the Todd in an open boat from Ft. George. The Issac Todd sailed away for China under the command of Capt. Frazer SMITH. The Isaac Todd had left behind four Spanish cattle at Ft. George. These and the goats and hogs brought by the Astorians became the early basis for domestic livestock in Oregon. In May of 1814 Ross COX, who had joined the Northwest Fur Company, traveled with 5 companions to the Yakima country (around Spokane House). Alexander ROSS, Tom MCKAY, and 2 unnamed Canadians traveling with native wives were also in this region and traveled to a village where over 3000 had camped to gather camas roots. Negotiations were wary and tense but Ross traded for 100 horses. Registre BELLAIRE in 1814 hired 4 Hawaiians to pursue the fur trade with him in the Walla Walla Valley region. Pierre DORION, an overland Astorian who had gone to hunt in the Snake country in 1813, was killed by Indians in 1814. His widow and 2 children hailed an upriver-bound boat of trappers for rescue near the mouth of the Umatilla River at the Columbia in 1814. In 1814, the US Congress forbid any British or Canadian concerns to trade with Native Americans of the Missouri River Basin. By 1816, J.J. Astor had bought out all British holdings in US territory east of the Rocky Mountains. The WAR OF 1812, which included the burning of Washington D.C. in August 1814, exaggerated American resentment toward and competition with the British. The Treaty of Ghent officially ended the war on December 24, 1814. News of peace and the implementation of the Treaty took a long time to reach the Northwest. The agreed upon British-American joint occupancy of the lands between Russian Alaska and Spanish California was not made official in Oregon until 1818. In the summer of 1815, James MCMILLAN, Nicholas MONTOUR, and Ross COX hunted in the Spokane Plains.